Rhythm may not come naturally to some people. A new study suggests those people might not be great talkers either. Scientists studied a group of high school students,and found those who were better at keeping a beat musically had superior language skills compared to their more rhythmically-challenged classmates. The scientists say this phenomenon reflects a link between the brain's ability to encode auditory signals -- or sounds -- and other brain processes that control for movement, language and reading skills. 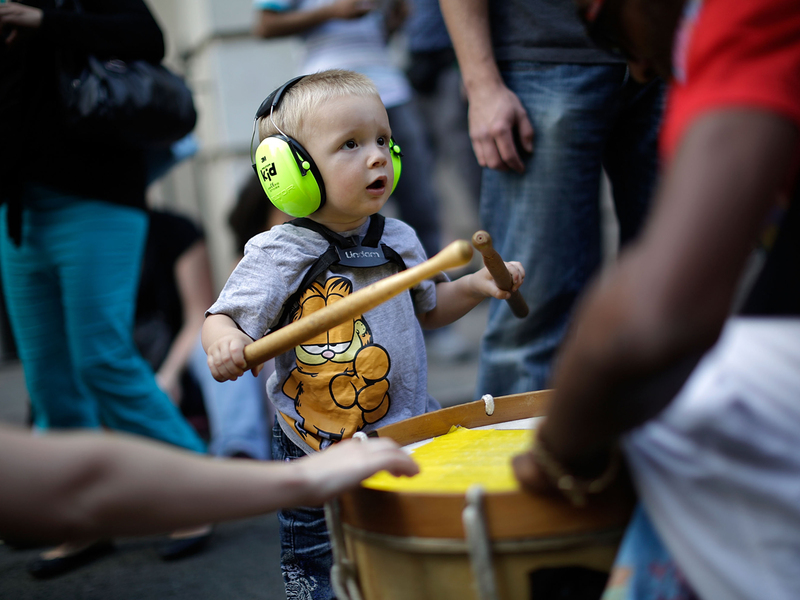 "Rhythm is an integral part of both music and language," study author Nina Kraus, a neurobiologist and speech researcher at Northwestern University in Evanston, Ill., said in a statement. "And the rhythm of spoken language is a crucial cue to understanding." The study could especially have significant implications for children's reading skills, according to the researchers, which previous studies have linked to rhythm. Researchers enlisted almost 125 Chicago-area high school students for the study, published Sept. 18 in the Journal of Neuroscience. They were given two tests. The first one involved a metronome, the tick-tocking device that keeps perfect rhythm that may bring back old memories of piano lessons. The students were asked to listen to the metronome, then tap their finger along with it on a special pad that recorded their responses, which scientists measured for accuracy. In the second test, electrodes were fitted on students' heads to measure their brain waves while they were asked to repeat syllables. The researchers said the findings support the idea that the brain waves originated from an area of the brain that ties audio processing, rhythm and language together, a so-called "biological hub." "An activity that requires coordination of hearing and movement is likely to rely on solid and accurate communication across brain regions," Kraus pointed out. The findings could apply to reading, because hearing speech sounds and associating them with letters and words are crucial for kids learning how to read. The scientists said the association between reading and beat-keeping ability also likely shares a common basis in this auditory hub. For example, tiny timing changes help distinguish between consonants like "B" and "P," said Kraus. Music training may help kids improve their language and reading abilities given the findings, because an instrument might help exercise the auditory system, leading to stronger sound-to-meaning associations that are essential for learning how to read, she added. "By directly linking auditory responses with beat-keeping ability, we have closed the triangle," she said. "This study adds another piece to the puzzle in the emerging story suggesting that musical-rhythmic abilities are correlated with improved performance in non-music areas, particularly language," Dr. John Iversen, a neuroscientist at the University of California San Diego, who was not involved in this study, added to LiveScience.